I should be studying for my midterms, but some things seem a bit more important at the moment. 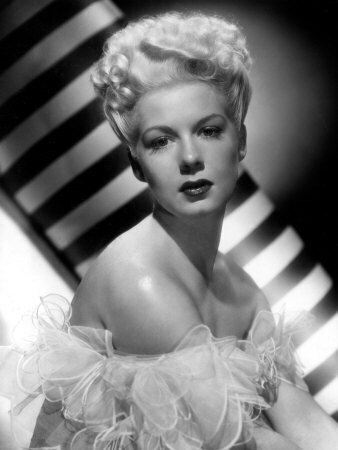 Betty Hutton, a celebrated singer and actress who starred in musicals and comedies during the 1940s and 1950s died on Sunday. She was 86. In The Miracle of Morgans Creek, Hutton plays Trudy Kockenlocker. In the first scene that we encounter Trudy, she is lip-syncing a song, sung by a man with a deep bass voice. During the scene, she shifts her body, rising up and down as the tone an pitch changes. It’s a pretty incredible moment and (in my opinion) sums up Betty Hutton. Hutton was “a brassy, energetic performer with a voice that could sound like a fire alarm”. She starred in such films as Annie Get Your Gun and The Greatest Show on Earth. Her on-screen presence was energetic and just incredible. Last week in my film class, we watched The Miracle at Morgan’s Creek; I was the only person out of 40 who had seen it. It’s such a shame that she isn’t very well known. Her career faded as quickly as it had grown; her last film, 1957’s Spring’s Reunion received little recognition. Hutton disappeared into obscurity, but during the 1980s her career had a reemergance of sorts. She appeared in the Broadway musical Annie and was teaching comedy at Emerson College. Betty Hutton was a fantastic and energetic performer. She was more appreciated than she’ll ever know. Rest in peace, Betty. Youse was good peeps. Annie Get Your Gun was the first time I noticed Betty Hutton, and it still is my favorite film of hers. The musical moments in that film are as magical as anything in Singin’ in the Rain or The Wizard of Oz. Only the film’s use of dated Native American stereotypes prevent it from reaching mainstream popularity. I have a question; does anyone out there know which movie it was that Betty Hutton was in where she sang, with tears streaming out of her eyes, “It Had To Be You”??? It must have been in the 40s as I remember seeing at the United Artists Theater in Berkeley, and I moved from Berkeley to another town in No. CA when I was 11??? I know “The Sewing Machine” was from Perils of Pauline and my 11 year old granddaughter and I watched Annie Get Your Gun today. I am jdouma@sbcglobal.com I had forgotten how absolutely fabulous this woman was, as some said, Judy Garland? Lucy Ball? A treasure and a talent………………thanks if you know the answer?? Previous Previous post: North by Northwest is TAKING OVER MY LIFE!